Andre Rieu Under The Stars DVD from DVDLand. Fall in love again with Andre Rieu and his Johann Strauss Orchestra as they bring you a show of favourites under the star-studded summer skies. Andr returns to his hometown of Maastricht bringing with him two wonderful guest choirs - the Harlem Gospel Choir and the Soweto Gospel Choir - and a host of special guests. Watch Mirusia fly through the air singing Supercalifragilisticexpialidocious (from Mary Poppins), feel the thrill and passion of the Harlem Gospel Choir and the Soweto Gospel Choir. From Spirituals to Musicals, and Folk Songs to Waltzes, this is a glorious and thrilling celebration of music. DVDLand is the home of the Andre Rieu DVD. I brought this dvd for my mum for mother's day and she absoutly loves it. 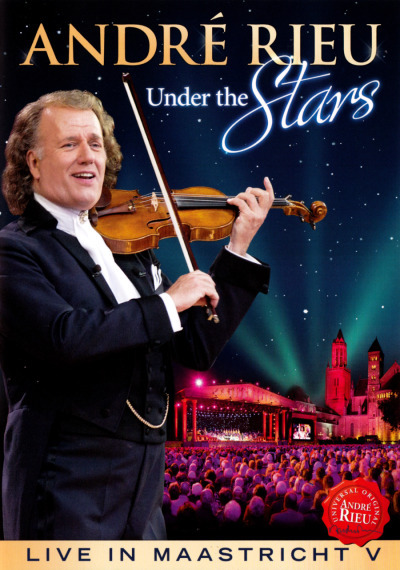 Click the button below to add the ANDRE RIEU - UNDER THE STARS LIVE IN MAASTRICHT V to your wish list.